A trio of factory Audi stars will drive for Valvoline Jamec Pem Racing in the 2018 Liqui-Moly Bathurst 12 Hour. Double 12-hour winner Christopher Mies will be joined by 12-hour Audi regulars Christoper Haase and Markus Winkelhock in the first of a two-car, all-professional campaign planned by the Melbourne-based squad. Mies has one of the best track records of any international driver in 12-hour history – twice winning the race for Audi in 2011 and 2012 – and has contested every race since his last win. Haase and Winkelhock both made their respective Bathurst debuts in 2015, both driving for Phoenix Racing. Winkelhock finished second outright in his debut year and fourth in 2016, though the Jamec-Pem Audi he shared with Robin Frijns and Frank Stippler was an early non-finisher. Haase partnered with Mies and Supercars star Garth Tander to finish 13th this year, though setbacks throughout the day ensured their final finishing position didn’t match their pace shown throughout the race. “It has been a long time between drinks for Audi at Bathurst so this line up is an indication of how serious they are, and how serious we are as a team, to return them to the top step of the podium,” Team Principal Troy Russell of Audi Sport Customer Racing Australia said. “Chris, Markus and Christopher aren’t just factory Audi drivers – they are now hugely experienced at Bathurst which is a big advantage. Valvoline Jamec Pem Racing team will enter the 2018 Bathurst 12 Hour off the back of a remarkable season in domestic GT competition, where they won two of the three available titles. Geoff Emery (who partnered with Kelvin van der Linde in four of the five rounds) won three races en route to the CAMS Australian GT Championship while Steve McLaughlan won the Australian GT Trophy Series. 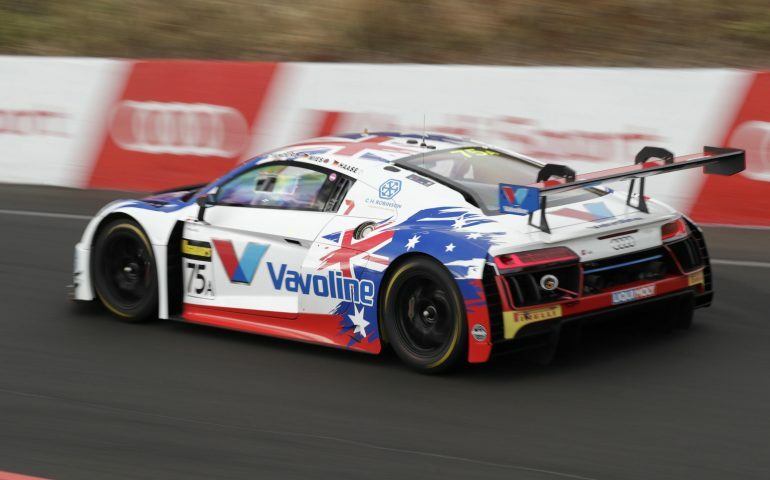 Meanwhile, Jaxon Evans and Tim Miles won two of the four races to ultimately finish second in the CAMS Australian Endurance Championship, also in a Valvoline Jamec Pem Audi R8. The team will confirm the trio of drivers in the second Valvoline Jamec Pem Racing Audi R8 LMS within the next week.